Mainistir na Corann – how to steal land….and other monastic misbehaviour! Cahermone Castle is a massively built fifteenth century tower house on the southern bank of the Dungourney River just east of Midleton. Built by a branch of the FitzGeralds, it may stand on the site of an earlier residence. Just a few yards to the east of his facade is the point where the watercourse from Loughaderra meets the Dungourney River. This was the watercourse that the Abbot Robert tried to divert in 1307. In 1309, the abbot of Chore abbey (Mainistir na Corann) was fined one mark by the King’s court for diverting the watercourse between Dunarlyn and Cathermoyne. On appeal, Abbot Robert got this fine reduced to two pence! What on earth was all this about? Well, it was all to do with land and money. In medieval Ireland every parish had tithes levied upon it to pay for the upkeep of the church and its clergy. Sometimes the produce from the tithes had to go to a cleric or religious house far away – perhaps even in England. But in this particular case the story was very local and it very likely upset the Bishop of Cloyne too! You see, the abbot had interfered with parish boundaries! I wondered about this watercourse, and on inspecting the first edition Ordnance Survey map I found that it marked out what is certainly the watercourse mentioned above. And watercourse is the correct word – for it isn’t really a stream. It looks more like a water-filled ditch bordering several fields. Intriguingly the origin of this watercourse lies at Loughaderra or Loughaderry. Situated about four miles east of Midleton, and a mile west of Castlemartyr, Loughaderra is a small lake lying right beside the main road to Youghal. Although it has no apparent outflow, in fact, Loughaderra feeds a small watercourse that flows through a marsh or bog just to the west and then flows into Ballybutler lake. A surprising number of people don’t know about this second small lake because it is situated in the middle of farmland, and away from any roads. From Ballybutler (or Butlerstown as it was also called) the watercourse flows just west of Churchtown North graveyard and the Two Mile Inn pub. The ruined medieval church in the graveyard was the parish church of Inchinabecky parish, despite being located at the southernmost point of the parish! The watercourse then flows in a north westerly direction towards Cahermone Castle and empties into the Roxborough or Dungourney River just before reaching the castle. This watercourse divides two townlands just before the Dungourney River – Roxborough lies to the north-east and Cahermone lies to the south-west. Everything north-east of the watercourse was in Inchinabecky and everything to the south-west was in Mainistir na Corann or Corabbey Parish (as Midleton was then called). This latter parish was the parish of the Cistercian monastery ruled by Abbot Robert. The two townlands mentioned in the indictment were Cathermoyne, or Cahermone in Mainistir na Corann parish, and Dunarlyn. Dunarlyn was most likely the modern Roxborough townland in Inchinabecky parish – it’s the only one that fits, being situated on the other side of the watercourse. Abbot Robert seems to have been obsessed with land – and with good reason. You see, the Abbey of Chore (Mainistir na Corann) was already in financial difficulties. The later history of the Abbey of Chore or Mainistir na Corann is part of the rather sorry tale of the gradual decline of the Cistercian order in Ireland until the dissolution of the abbeys by King Henry VIII. Questionable clerical standards, difficult finances and an obsession with land appear to have been the lot of the monastery – or at least of the abbots. What happened at Mainistir na Corann was pretty much the same story that can be found in the Cistercian order throughout Ireland from the later 1200s to the dissolution of the monasteries under Henry VIII. There was, apparently, steady decline in standards of religious life and adherence to the Cistercian rule throughout this period. This wasn’t simply a uniform decline – each monastery was different. Some were endowed with large and viable estates and others were barely able to scrape by with very small estates. Several records survive in the Calendar of Papal Letters indicating that abbots sought ecclesiastical benefices (rectories or vicarages) as a means of boosting the monastic coffers. Several Irish monasteries ended up in debt to Italian bankers. Despite the restoration of Cistercian discipline after the Conspiracy of Mellifont and the Visitation of Stephen of Lexington, things went awry in Mainistir na Corann very quickly. Already in 1278 the abbot of Mainistir na Corann was rdeposed for being absent from the General Chapter for seven years! This was barely two years after the Mellifont affiliation of Irish Cistercian monasteries had been restored! A few years later the Papal Taxation lists recorded that Chore Abbey (Mainistir na Corann) was valued at just twenty marks, with the tithe being assessed at two marks per annum. This was a very small value although it probably only applied to the monastic parish, which was smaller than the monastic estate. A note appended to the taxation assessment suggested that there was little hope of collecting the Papal tax given that the monastery was already heavily in debt! One would love to know if this money was owed to the Italian bankers noted above. Then we find that the abbot of Chore is in serious trouble in 1301. Along with Richard Codd he was summoned by the King’s law court for unjustly removing Nicholas Joyce from his farm at ‘Lycham’ and ‘Roskagh.’ In effect the abbot was engaged in a land grab, or was assisting in a land grab! The question arises here; where exactly were Lycham and Roskagh? Denis O’Sullivan says that these are townlands in the civil parish of Bohillane, between Ladysbridge and Garryvoe. Indeed there are townlands called Loughane and Rooskagh in that parish. MacCotter suggests that they are actually the particles of Sythan and Rooskagh in Carrigshane townland – due east of Midleton and within the boundaries of the old civil parish. Given what happened in 1307 with the diversion of a watercourse by Abbot Robert, this latter may be the more likely location. Indeed one wonders if the abbot in question in the 1301 case was actually the same Abbot Robert – who clearly had form! Robert was obviously notorious for his land grabbing – in 1307, aside from attempting to divert the watercourse, he successfully sued for the recovery of lands at Donickmore near Ballygibbon in Mogeely parish from Thomas Hodnett. The abbots of Chore (Mainistir na Corann) were not above suing major regional lords for the recovery of monastic property. In 1342, the then abbot sued for the recovery of a mill, a messuage, and two carucates of land from David FitzDavid Barry of Buttevant – a relation of the lord of the Barrys, a family that tried for centuries to get hold of the abbacy of Chore. monastery. In 1307, Abbot Robert of Chore was charged with diverting a watercourse between ‘Dunarlyn’ and Cahermone townlands. These townlands were located in two different parishes. The map shows the townland divisions marked in red – Cahermone is at the bottom with the later castle picked out in green near the point where the disputed watercourse meets the Dungourney River. The civil parish boundary as a broad blue line. The barony boundary is in yellow. 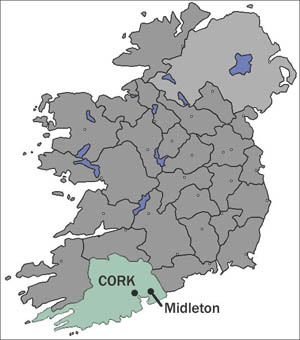 The boundary between Midleton and Inchinabecky parishes follows the broad blue line in a loop from top right almost to bottom left and turns sharply to the right again. The overlaid blue line from top left to bottom left shows the course of the Dungourney River (labelled DR) which flows into Midleton. 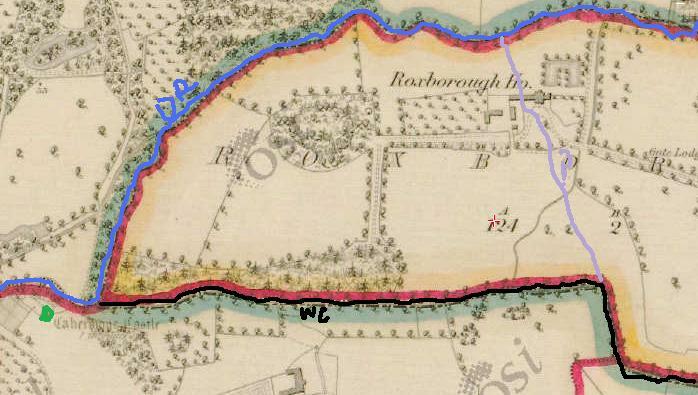 The parish boundary is also marked by the overlaid black line at the bottom – which follows the watercourse (appropriately labelled WC) that Robert tried to divert. The grey line (labelled ?) going from south to north is my suggested route of the abbot’s attempted diversion – cutting off a chunk of Roxborough townland – then called Dunarlyn. A real land grab, medieval style. The map is the six inch first edition Ordnance Survey map. The Great Famine of the early 1300s and the Black Death of 1348-50 left much of the rural economy of medieval Europe in tatters – especially with the loss of between one third and one half of the workforce. The feudal lords tried to enforce their feudal manorial rights as if nothing had changed, but the labour shortage forced them to gradually give way to peasant demands. For the Cistercians the disaster was compounded by the loss of lay brothers – the illiterate lower class of monks who did all the manual labour that kept the monastic economy going. Indeed the communal lifestyle of the monks may have made the effects of the great plague even worse than usual for disease spread like wildfire in these communities. This forced the Cistercians to become common landlords, parcelling out the estate to peasant farmers who paid a rent in cash or kind for their farms. Effectively the monasteries lost the day-to-day control over their lands. 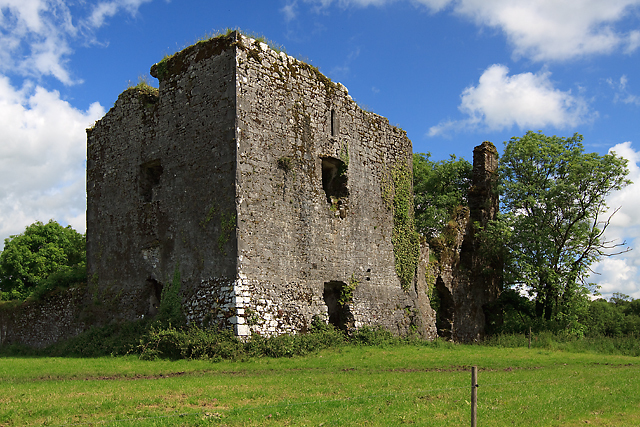 This didn’t stop the Barrys from trying to gain control of Mainistir na Corann – in 1443 the death of Abbot Philip O’Loughnane led to a dispute between Rory O’Loughnane and John de Barry, a monk of Whitland Abbey in Wales. Barry was imposed on the monastery by his relatives who used force of arms to impose him. In 1447, Rory O’Loughnane appealed to the Vatican to be authorised to succeed Philip as the legitimate abbot. Rory had to get a dispensation on account of his illegitimate birth and then sought Papal sanction to remove John Barry as abbot of Chore. It is likely that Rory was the illegitimate son of Abbot Philip – clearly celibacy was an aspiration rather than a reality for many clerics at the time! The dispute was resolved in 1450 when John Barry was transferred to Tracton Abbey – a house founded and controlled by the Barrys, and Rory was able to be installed as abbot in Mainistir na Corann. Incredibly there was an attempt to unseat him by one of his monks, John O’Dorney in 1463! The last abbot of Mainistir na Corann was Philip FitzDavid Barry – the Barrys had finally, and indisputably, got their hands on the abbey. As a result of this the abbey estate was transferred from Imokilly barony to Barrymore barony for some centuries. When Henry VIII’s dissolution of the monasteries came to Mainistir na Corann in about 1543, The following year Abbot Philip (helped by his Barry relatives) managed to negotiate a twenty-one year lease of the abbey estate for himself at an annual rent of £3.14.4 (£3 14 shillings and 4 pence). In the eyes of the Crown the abbot and his monks were now laymen, but it is likely that Philip maintained some discreet form of communal religious life in the abbey for some years. Already in the reign of King Edward VI the estate of Chore was behind in its annual rents to the Crown. Some things never changed, it seems. Abbot Philip’s lease fell due in 1565, in the reign of Queen Elizabeth I, who transferred the lease to another leaseholder.